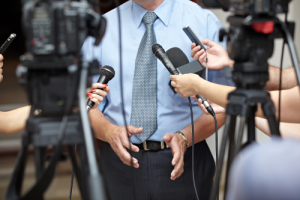 Why do you need to prepare your media spokespeople? You can’t always be there when your spokespeople speak to journalists but there are ways you can prepare your team to ensure their interaction with the media is as successful as possible. Firstly, make sure your spokespeople; have a real understanding of the media, know the dos and don’ts, and can handle interview situations before you ask them to meet journalists. If they haven’t already been trained or if you think they need some polishing it is advisable that you put them through some formal media training. Secondly, you should provide your spokespeople with a media pack they can keep next to their desk. What should your media pack include? A list of press officers: A full and comprehensive list of PR contacts (with phone numbers and emails); in-house and agency if relevant, this will enable your spokespeople to get hold of the press office if they need advice and guidance. A contact list of all other spokespeople: By knowing who else can comment to the media (and their area of expertise) your spokespeople will be able to refer a journalist’s question, if they don’t know the answer themselves. Information for specific interviews: Provide as much information as you can on upcoming interviews. What is the interview about? Who is the journalist? What is their likely agenda? Difficult questions: Prepare a list of all the difficult questions your spokespeople could be asked and aim to supply appropriate responses to each of them. Formal media training and coaching would certainly have saved some of the public relations disasters we’ve witnessed over the years. While the positives that come from dealing with the media greatly outweigh the negatives, you are gambling with your reputation if you don’t plan interview opportunities. Run by current and former journalists, our bespoke media training courses are full of easy-to-use tips and techniques that you can soon be using as second nature. Once you have this knowledge, we then help you to deliver your story and message in the most effective way possible. GET A FREE COURSE OUTLINE or find out more about how we can help you- please get in touch on 0845 230 2601 or email info@bluewoodtraining.co.uk.